This large timber shed has a look and appeal of its very own, thanks to its reverse apex orientation and the wide opening double doors which mean that it’s practical as well as attractive. With a generous height combined with a wide frontage and accommodating depth, you can fit more inside than you may at first think. 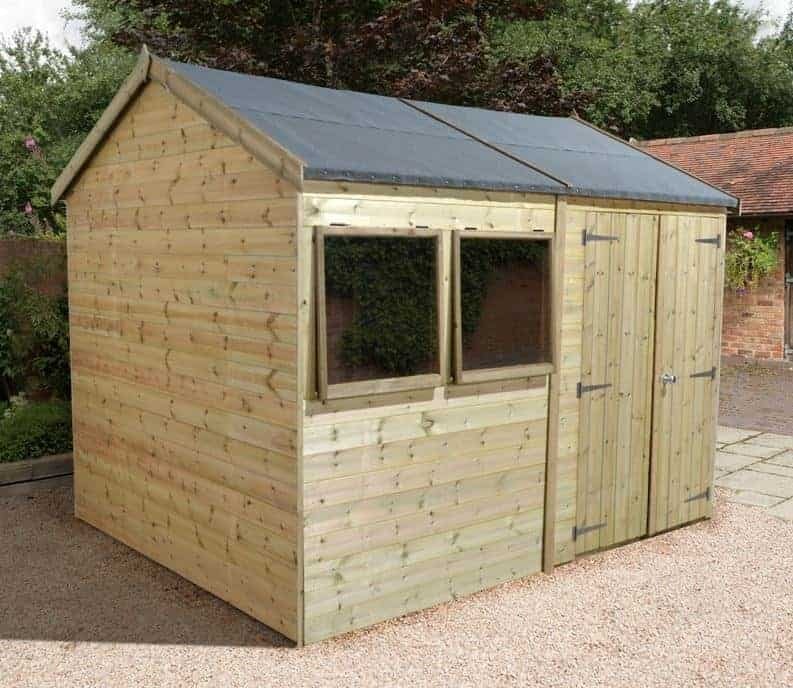 That’s just one reason why we think this shed will be a good choice as a workshop for a hobby, or even a job, as well as a large garden storage shed. Whatever you keep inside, you’ll want to know that it’s going to keep dry, so it was good to see that this particular garden building delivers excellent weather protection. The roof itself is one line of defence, with rain or snow being channelled away, but this is aided too by the pressure treated cladding across the whole of the surface. It’s so effective at keeping precipitation out that the manufacturers have been able to give a long lasting 15 year warranty against rot. The two windows let a plentiful amount of light in, but we were pleased to see that they featured toughened glass. 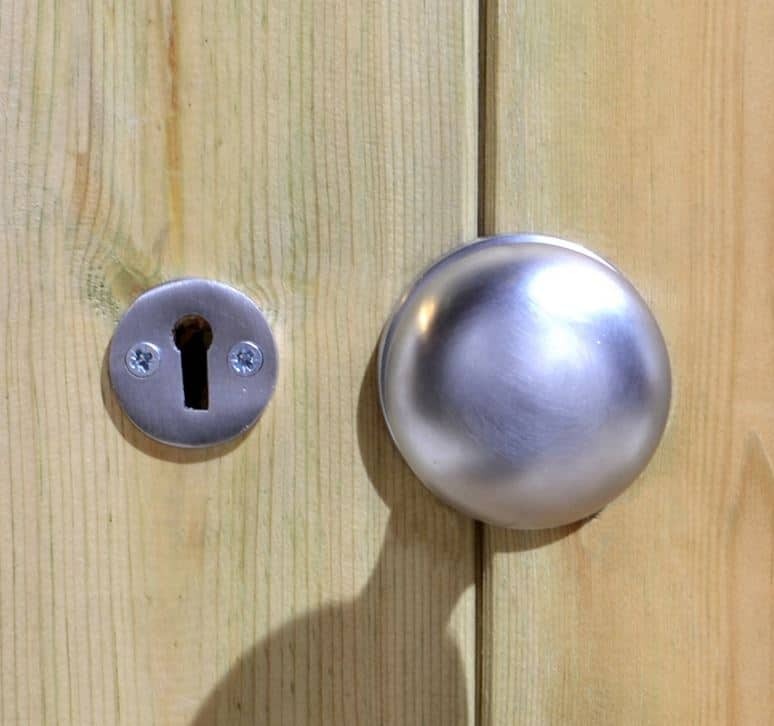 Security is further enhanced by the inclusion of a tough locking system, which isn’t something we always find on the sheds we review. We liked the reverse apex design of this well sized timber shed for two reasons. The first is that it delivers a unique twist on a truly classic styling, so that you’ll be proud to have it in your garden; it’s sure to attract compliments. The second is that the change in orientation that comes from the reverse apex, with the front width being greater than its depth, makes it ideal for gardens that are themselves shallow or that aren’t perfect rectangles. The roof still performs the vital functions of an apex, of course, in that it both prevents rain from being able to settle on the surface and it adds extra height and vertical storage space. The peak height is a tall 2.54m and the eaves height is 1.95m, both of which are greater than those on most wooden sheds we review. The overall depth of the shed is 2.44m and the overall width is 3.02m, so keep these in mind when choosing a suitable place on which to site it. Strong cladding and framing is essential for a large shed, especially if it’s going to be housed in an exposed area, so we were glad to see that high quality tongue and groove shiplap cladding, with a thickness of 12mm, had been used throughout. The framing size of 34 X 34mm wasn’t the thickest we’ve seen, but it still creates a strong and stable garden building when assembled. Some sheds we review have floors made of solid sheet material, which is cheaper to produce but not quite as tough as tongue and groove. On this occasion, however, we were pleased to see a tongue and groove floor that should offer a good load bearing capacity. 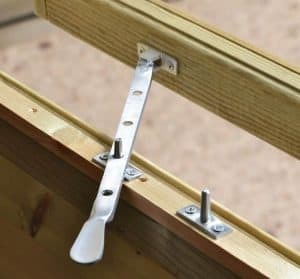 It also comes with pressure treated floor joists which do the essential job of raising the base above ground level, and thus keeping moisture and rot away. We knew that this shed will have excellent water, and therefore rot, resistance because of the winning combination of a reverse apex roof on top of thick tongue and groove cladding. It’s further enhanced by the use of pressure treatment to force preserver into the wood prior to delivery, which was something we were very glad to see. 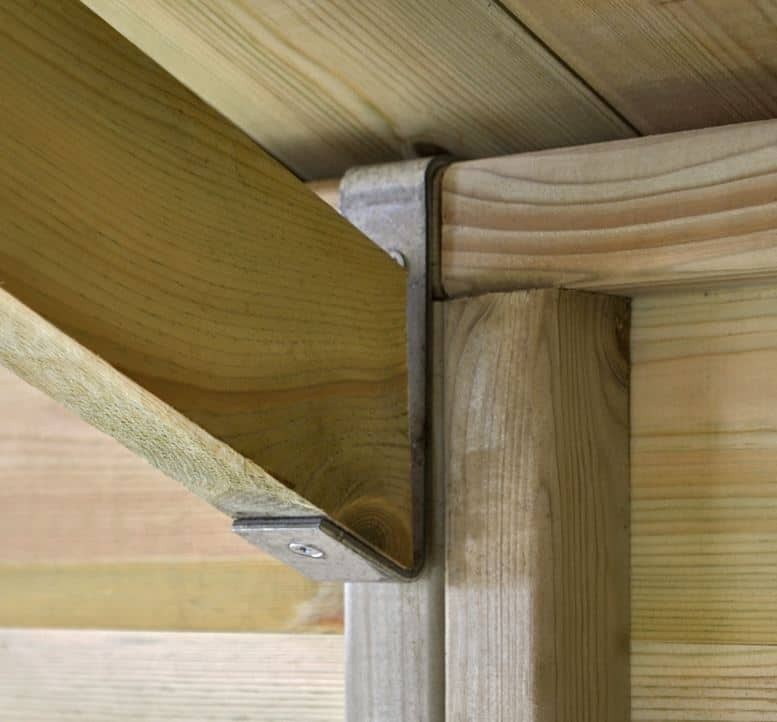 It means that the timber will be very durable, and this is shown by a 15 year warranty against rot, which is the longest we see provided on timber sheds. 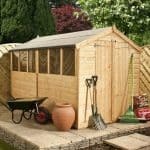 You’ll also be pleased to hear that this shed doesn’t require immediate re-treatment as some do, but we’d still recommend taking a look at it every year and adding more wood preserver if necessary. 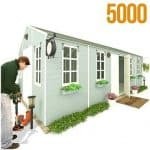 The doorway is one of the most important features of a shed, as you don’t want to have to twist and turn if you’re carrying heavy or wide goods in and out. That’s why we were very impressed with these double doors. Fully braced, and secured by strong hinges they have a width of 1.21m and a height of 1.80m making it easy, and safe, to store and retrieve objects of any shape and size. We also liked the two windows, because they contain toughened glazing and were fully opening rather than fixed. This makes it easy to get ventilation into the shed, as well as natural light. 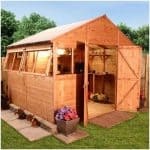 These are essential factors if you want to spend extended periods of time in the shed or use it as a workshop. 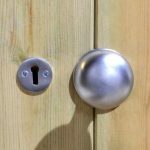 The tough windows and door can themselves act as deterrents to opportunistic crime, but the greatest deterrent on this shed is the key operated lock. 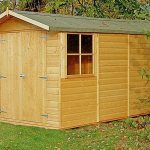 It’s included as standard, which we found very welcome as many sheds we review don’t include any locking system but instead place the emphasis on the customer to source and fit one. 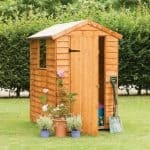 We know that some people can find the thought of assembling their own shed daunting, or simply don’t have the time in their busy lives to complete the task, and this can put them off buying a garden shed that would bring them significant benefits. That’s why we were pleased to see that a professional installation service is offered here, for a price of just £149. Other options available included a 10’ X 8’ workbench, which is worth considering by people who plan to use this shed as a craft workshop. There’s also the possibility of having a slatted roof, although we found the standard felt covered tongue and groove roof to be more than adequate. We could tell this shed was very high quality simply by looking at how well the components were made, and there is great attention to detail throughout. The use of pressure treated tongue and groove cladding on all the surfaces is very welcome, although we feel the frame could have been slightly thicker. 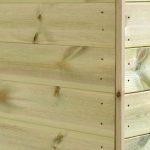 For a small or medium sized garden this offers a good amount of storage space, particularly considering the generous height. 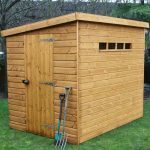 Despite its size and number of components, we feel that this shed is relatively easy to assemble as long as the instructions are followed. With two people, expect to take around four to six hours, although you can of course use the optional installation service. Just sneaking under the thousand pound barrier, this nevertheless offers good value for money considering its durability and quality. Final Thoughts: It’s good to see a shed that is ready to use once assembled, without the need to buy extra items and components. 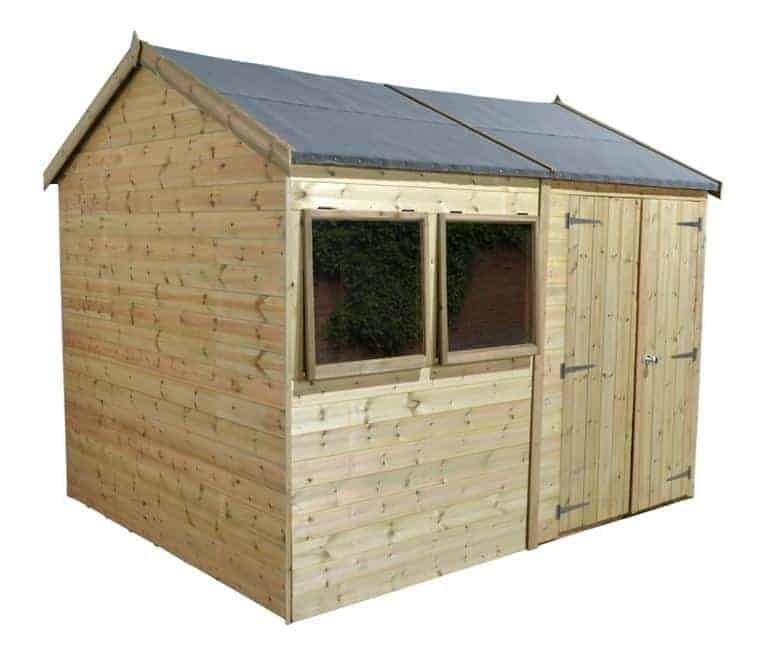 That’s exactly what this shed delivers, thanks to its tough opening windows, locking system included as standard, and integrated floor joists. It means that while the initial price tag isn’t the cheapest we’ve seen, it compares well to many other timber sheds of similar dimensions. 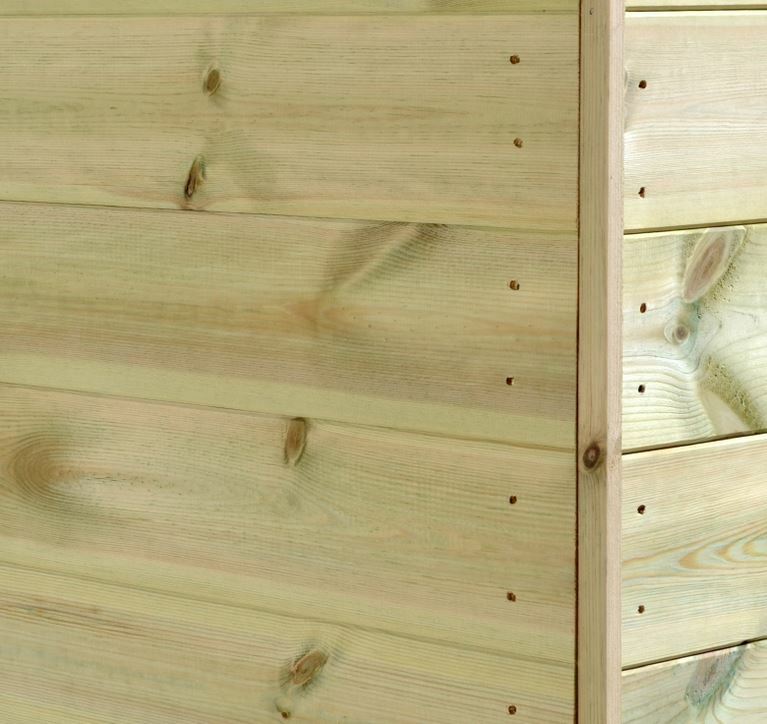 The reverse apex contributes to a pleasing appearance, and because it’s so water and rot proof we think it will stay looking just as good for many years to come, as demonstrated by the long and reassuring manufacturer’s warranty.